The ISA Operations Division hires Protective Service Agents and other subject matter experts for long and short term assignments as needed. There is no guarantee of future employment after the completion of an assignment, but those who conduct themselves professionally will be considered for future assignments provided they still meet the requirements for employment. All qualified applicants will receive consideration for employment without regard to race, color, religion, gender, gender identity or expression, or sexual orientation. All applicants are considered based on prior experience and documented performance, training, education, and results of background checks. Note: Experience can be gained in the employ of any national, state/provincial, local or commercial entities providing protective services. Be at least 21 years of age at the time of application, Veterans’ may apply after completion of military service regardless of age. In 2017-2018 ISA meet its goal of hiring agents and support staff with the training, education and professional experience our clients expect from us. 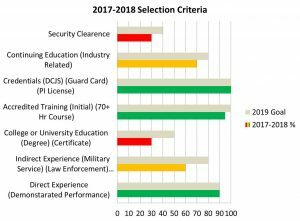 100% of our agents graduated from accredited training programs approved by federal, state or private security regulatory agencies such as the Federal Law Enforcement Training Academy, DOD Training Academy or the Virginia Department of Criminal Justice. 90-95% of those training programs were 70 hours or more in length. 100% of our employees had the required credentials, permits or licenses to provide services. 90% of our employees had proven experience for the position or role they were hired for. 10% of our workforce were interns and trainees working with experienced mentors and instructors. Only 30% of employees had a degree from a college or university, but 70% had a proven record of attending continuing education classes or training. All resumes are graded as they pass through the hiring process. The minimum score for consideration is 6 points. In 2018 we discarded on average 9 resumes a week for various reasons. Poorly written resumes with obvious mistakes in grammar, spelling, format, and content were given an initial look and then dropped from consideration. All candidates will have their resumes compared to online professional media accounts such as Linked-In to look for errors and omissions. All candidates will have their social media such as Facebook, Instagram and twitter reviewed to ensure they do not demonstrate support for or are part of organizations whose beliefs or actions run counter to the principles of our company. It is recommended you use a resume writing service, or work with a job counselor, or employment agency if you have questions about writing your resume. Some of these services charge a fee such as resume.com and others don’t. Read all disclosers and terms of service prior to using this or any service. ISA does not endorse this, or any resume writing product or service.